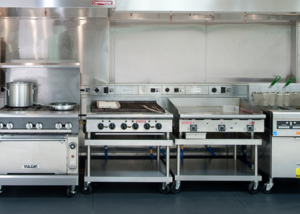 When evaluating or refurbishing an existing commercial kitchen, choosing the right equipment is essential for operational success. 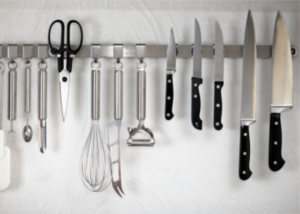 We have put together a list to help you cover all your bases when it comes to kitchen equipment. Although every camp kitchen and service is different, our goal was to give you a list that you can build off of to meet your needs. The below items are broken down to give you a clear picture of each category of kitchen equipment. Cooking equipment is the foundation of any commercial kitchen. When evaluating or upgrading equipment in the camp kitchen, be sure to think about what pieces of equipment you are going to use most often. Make sure to know what your capacity needs are so that the equipment that you use regularly and most frequently are of good quality. This will save you dollars down the line. Oven: This functional piece of equipment can be used for baking, roasting, braising, and more. As a result, multiple ovens in important for the camp kitchen. Range: Most camps with be equipped with a gas range and as you know this piece of equipment is a must. There is no way around having a good range in the camp kitchen. Deep Fryer: Deep fryers may be essential to some camp kittchens. The menu can have an effect to whether you need one or not. If you want to move to wards a healthier way of cooking, this equipment is not necessary. Flat Top: Flat tops are a pillar in the camp kitchen and can be used for a variety of different cooking methods. Holding Equipment: Warmers keep your food at a specific temperature, which is essential when feeding large groups of people and maintaining food safety standards. They also work to proof breads before baking. You must make sure that you have enough of these in your kitchen, especially if you are serving FAMILY STYLE. Toaster: In the camp kitchen/dining area, a commercial toaster is a must for your bread and bagels during breakfast. Coffee Brewer: Coffee is a popular beverage, especially for summer camp staff life and it is imperative that you have a reliable and good quality coffee machine. This can usually be obtained free of charge from various food purveyor such as Sysco. Microwave: Microwaves are a convenient way to heat up sauces, defrost frozen foods, and re-heat products. If not in the kitchen, the dining hall should have at least one of these. Refrigerator: Some common types of refrigerators include walk-in coolers, reach-in fridges, or prep fridges. It is likely that your kitchen will require a combination of different types to facilitate a smooth meal service. Freezer: Like refrigerators, freezers come in various sizes and styles to suit your needs and food capacities. Freezer space is essential in order to keep the kitchen operation ahead of the game. Ice Machine: Ice machines are an essential component for the camp kitchen when it comes to refreshing liquids for active kids. Additionally, this will be used to fill salad bars for holing cold items within good temperature zones. 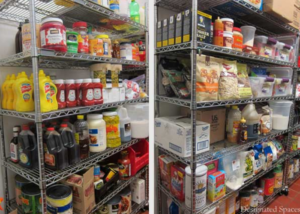 Shelving: You can use shelving in your walk-in cooler or freezer for storing different foods. You can also use shelving for storing pots, pans, dinnerware, dry ingredients, and more. You can easily customize your shelving for the best use in your available space. Utility Carts: Utility carts are essential to have in the kitchen due to their multiple functions. You can use them in the front-of-house area for setting up cleaning stations or filling the salad bar and in the back-of-house area for moving heavy equipment or ingredients. Sheet Pan Racks: Sheet pan racks come in many different configurations, all of which are designed to transport foods and help you cool down and store foods prior to use. Some options include front-loading or side loading racks, nesting racks, or racks with enclosed sides. depending on the location of the rack and what is being stored on them. They are necessary and ideal for cramped kitchen. Food Storage Containers: Food storage containers are the perfect multi-purpose tools. You can use them to store prepped ingredients, mix up sauces and stocks, or hold dry items like pasta or rice. Best of all, many food storage containers come with colored lids or markings, so you can color code them for easy organization. We suggest to use fish filet pans for stackable food storage with a great capacity. Drying Racks: Drying racks provide a place to not only store your equipment, but to also air dry it. You can use drying racks for drying dinnerware, smallware, cookware, cutting boards, utensils, and much more. Dunnage Racks: these racks really help with maintaining kitchen standards and keeping items off the ground. Dunnage racks are usually 6 inches or more off of the ground. You can use them for heavy items, such canned goods, bags of rice, or large pieces of equipment. You can even make your own. 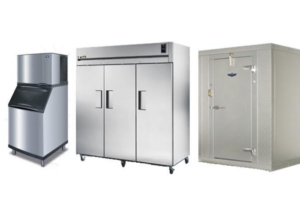 Additionally, when evaluating your refrigeration and storage equipment, consider your menu and what quantities of food you'll have to store. This will give you a better idea of how many refrigerators, freezers, and shelves you'll need. 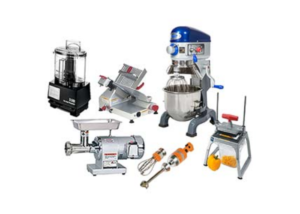 Food Processors: These versatile appliances can help cut down on valuable prep time. You can use them to make sauces, combine ingredients, chop vegetables, and shred cheese. This is a must if you have a salad bar. Prep Tables: Place appliances and equipment on top of these sturdy tables, or use them as a surface for prepping ingredients or plating up family style. Mixers: Any camp kitchen should be making constant use of this piece of machine. This is a useful piece of equipment that every camp kitchen should have. Immersion Blenders: These blenders have a multitude of uses. You can use them to make sauces, soups, or create marinades. Slicer: A good food slicer is essential in all kitchens and it can help you with preparing a whole host of different meals and snacks. This can save you significant time and dollars when serving deli meats/sandwiches and slicing items such as tomatoes and onions for toppings. Digital Thermometers: It is essential that you make sure that all of the food being served is up to temperature standards. Every kitchen should have working thermometers whether digital or not. Chef Knives: A sharp set of knives are the most important set of tools in a kitchen. Sharp chef knives not only make food prep easier, but they also decrease the risk of accidents and cuts. Cutting Boards: Also, if you want to color code your kitchen to prevent cross-contamination, you can purchase multiple colors of cutting boards and follow HACCP guidelines. Mixing Bowls: When purchasing mixing bowls, be sure to get multiple sizes for different functions. Pans: There are many kinds of pans, such as sauce, saute, braising, and fry. Consider which types your kitchen needs and in what quantity while evaluating your inventory. Pots: Similar to pans, there are multiple types of pots, such as stock pots, double boilers, pasta cookers, sauce pots, and more. Whisks: Whisks are a useful tool that you can use to incorporate air into your ingredients, giving them a light and fluffy texture. Your cooks will surely get their use out of them. Food Pans: Prepare dishes in the oven in food pans or use them to hold food in a food warmer until it's ready to serve. Food pans are especially essential for hot holding of foods, cooking of foods, and for serving foods buffet style. Kitchen Spoons: For stirring sauces, serving foods on the buffet, or removing ingredients from a bowl. These versatile tools should be on every kitchen equipment list. When serving family style, the camp kitchen must have an abundant amount of serving spoons to facilitate the meal service or you have a problem. Turners/Flippers/Spatulas: If your camp kitchen is planning on using griddles, charbroilers, or grills, turners are must-have tools. Choose turners with high-heat handles to keep your staffs’ hands safe. Tongs: Tongs have a lot of utility, and you can use them for food prep, plating, or serving purposes, depending on your needs. Additionally, they will be used when serving food whether it be family or buffet style. Either way you must make sure that you have more than enough for meal service. Serving Platters/Bowls: When serving family style you must make sure that you have enough platters to service the entire dining hall at max capacity. This can include multiple items that would go on platters or bowls such a pasta, meatballs, vegetables, and dessert. You should count and inventory these items before and after each camp season in order to make sure that you have a sufficient stock. Microfiber cloths and cleaning rags: Microfiber cloths and rags have many uses in the kitchen, from cleaning up spills, wiping down prep tables, drying smallware, and more. 3 compartment sink: These products are essential for cleaning and sanitizing your products completely and following health codes. In addition to your 3 compartment sink, you'll also need to invest in a grease trap and a commercial faucet. Foodservice chemicals and sanitizers: Choose the right chemicals for cleaning your commercial equipment, and don't forget to also get sanitizing chemicals that keep your products safe for food contact. Trash cans and recycling bins: Trash cans and recycling bins should be placed strategically throughout your kitchen and dining hall. 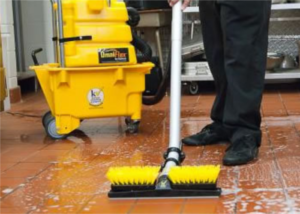 Mops and mop buckets: Mopping your floors at the end of the day helps clean up any spills and messes that accumulated during service as well as keep your kitchen as clean as possible. Scrubbers: Make sure that you have stainless steel scrubbers so that you can be sure to get rid of all large food items before putting items through your dishwashing machines or to clean items in the 3 compartment sink. Restroom supplies: Be sure to stock your restrooms with supplies like toilet paper, paper towels, and hand soap. Brooms and dustpans: Sweep up food dropped on the floor and underneath all of your equipment. You can use them to clean up messes in the front- or back-of-house area. Cleaning chemical buckets: Buckets are easily saved from items such as pickles and other items used in the kitchen. They can be saved to be used for janitorial purposes. When evaluating your commercial camp kitchen, it is essential that you gather feedback from the staff working in the kitchen, streamline your menu, have an employee manual, and make sure to always take inventory of your equipment and smallware. It is important to give the staff the tools that they need to stay ahead of the curve. Summer camp scratch quantity cooking is hard enough and staff should be equipped with the tools they need and a setup for success. This will make for a smoother and more efficient overall operation, keeping your summer camp staff and kids excited about the food that they are eating. Need help? Click here to ask us a question. We are glad to help.